Frequently Asked Questions - mGalla | Atom Technologies Ltd.
What is mGalla-Payment app for merchants? mGalla is a mobile application which allows merchants to accept digital payments from their customers through numerous payment options. Is mGalla a paid or free application? mGalla is a completely free app. Downloading and signing up with the application involves no charges whatsoever. Why should I opt for mGalla? With this era of digitization, it is crucial for any business, which wants to prosper, to accept digital form of payments. mGalla is a free application providing you a range of digital payment options on your fingertips. It is extremely convenient, easily accessible and provides a seamless experience of accepting digital payments. How is mGalla different from other digital payment applications ? Other applications provide you with one or may be two digital payment options, whereas, mGalla provides you 4 digital payment options like UPI, Bharat QR, Link based and mPOS, simply placed in one mobile app. The interface of mGalla is user-friendly and can be used by any one. How can I sign up for mGalla? Download mGalla App from Google Playstore or get in touch with our customer service center where our executive will provide you with a download link through SMS. Once you have downloaded the app, put in all the relevant information required. This is going to be so simple that it wouldn?t even take 5 minutes of your time. Can I Sign Up using my company?s registered name? Yes. When you opt for Sign Up you are provided with two options. You can either Sign Up as an Individual or as a Corporate. What all documents are required? You are simply required to put up a scanned copy of either PAN card or an Aadhaar Card to move on. Do I need to courier/send any documents to mGalla? No, you are only required to scan the desired document through the app. You do not have to send or courier any documents to us. I don?t have a PAN Card. What should I do? 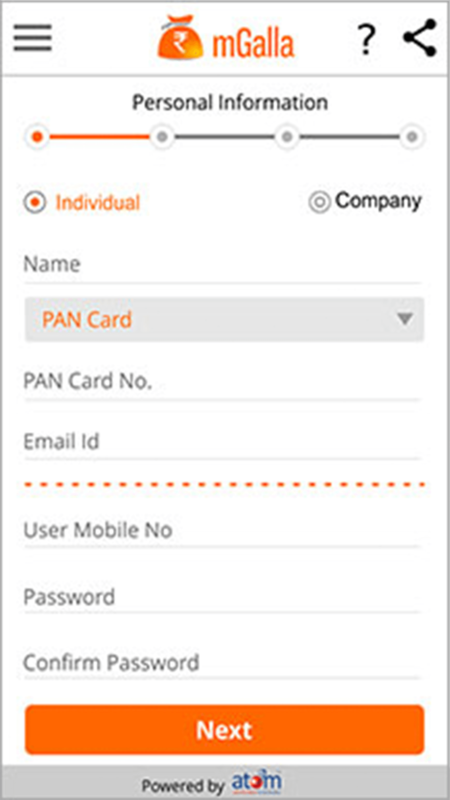 If you do not have a PAN card, you can scan your Aadhaar card for the verification purposes. We do not require both of your documents. Is it compulsory to submit the documents? Yes, it is compulsory for you to scan either your PAN or Aadhaar Card for verification purposes. Is mGalla safe and secured? mGalla is highly secured. We understand that you trust us with your money and so, we are here to provide you with bank level security features. Atom is PCI DSS v. 3.2 and SSL 256 bit encrypted, which is the highest level of security available. Is mGalla compatible with my android version? mGalla requires your phone to have an android version of 4.0.3 and above. This is the most basic android version and will definitely be compatible with your android smartphone. How many merchants do you have on board? Currently, we have more than 50,000 merchants who have collaborated with mGalla. Does my customer need to have mGalla application to pay me? No, your customer can pay using their existing bank appliaction without having to download any new app. How long will it take for you to onboard me? You are instantly on boarded with mGalla as soon as you download the application, complete the registration and provide us with all the necessary information. When can I start accepting payments through mGalla? As soon as you complete the Sign Up process with us, you can start collecting digital payments through mGalla. You can submit your KYC whenever you decide to get the amount settled in your bank account. Can I change my mobile number on mGalla? What payment options am I offered? mGalla offers you four digital payment options- UPI, Link, Bharat QR and mPOS. Link based payments: It’s an easy to use portal where you can generate your payment link in seconds by entering your customer’s name and mobile number. Once you have generated the link, you can share it with your customer through whatsapp, text message or an email. Unified Payment Interface or UPI: Accept funds using virtual payment address and forget putting in your bank details again and again. mPOS Terminals: mPOS or mobile point of sale is a portable device that you can sync with your smart phone or tablet and collect debit or credit card payments anytime, anywhere. 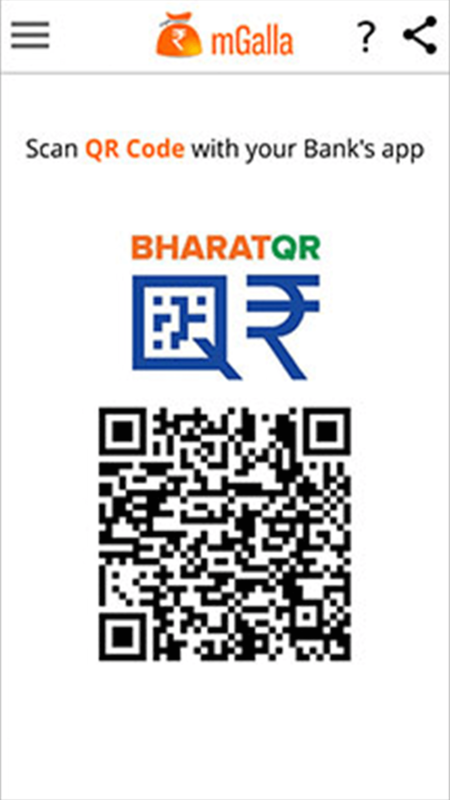 Bharat QR Payments: The merchant can generate a dynamic QR code through the mGalla app in order to receive payments. 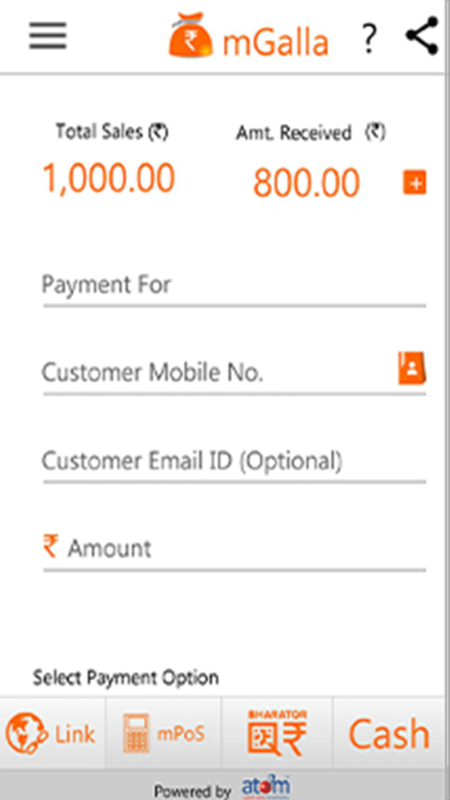 The customer can scan the Bharat QR code from their respective mobile banking app and make the desired payment easily. In the next update, mGalla will introduce an all new payment option ‘Aadhar Pay’ keeping the merchant’s and customer’s convenience in mind. How Bharat QR is different from other e-wallets? When you use any QR Code which has been generating from a specific E-wallet provider, then you can transfer money only on those specific E-wallets. But in Bharat QR, you can transfer money between every platform. You can send or receive payment between any banks or e-wallets. Which mobile banking applications support Bharat QR? Currently, 28 banking applications are supported by Bharat QR. What is mPOS? Is it different from other POS machines? mPOS is a portable card swipe machine which allows you to accept digital payments through Debit and Credit cards. Other POS devices are bulky and require heavy investment, unlike mPOS which fits into the merchant?s hands and is comparatively cheap. How does the mPOS device work? In order to accept payments through mPOS, the merchant needs to sync his mPOS device with the mGalla app on his smart phone. Syncing the devices is just a one-time activity. Can I accept payments through both credit and debit cards with this mPOS device? Yes, you can accept payments through both credit and debit cards irrespective of them being a CHIP based or Magnetic Stripe based type. 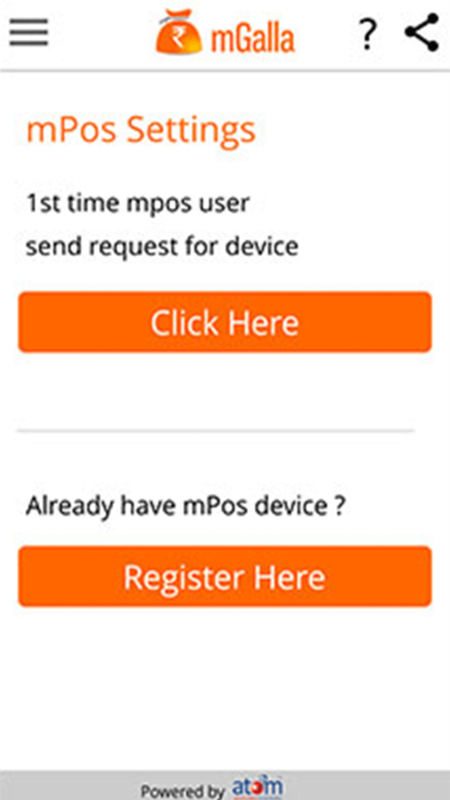 How can I request mPOS device? If you want to request for the mPOS device, you need to open the mGalla App> Go to the settings tab> Select ?request mPOS? option. Our sales executive will get in touch with you. You can also call us on 022 39853410 and get in touch with us for your request. Do I need to invest for the mPOS? Yes, if you want to rent an mPOS (Rent/service charge), it will cost you INR4400 for 12 months. Purchasing an mPOS device will cost INR3200 and would attract a service charge of INR200 every month. Can I link my existing POS device with mGalla? No, only our mPOS solution can be linked with your mGalla app. Is there a transaction limit with the payment options? Yes, there?s a transaction limit of INR 20,000/month on the payment options provided. If you want to get your limit increased, please contact our helpdesk on 022 66864095. I don?t have a website. Can I still collect digital payments from my customers? Of course! atom provides a plethora of digital payment options. You can collect digital payments even if you do not have a fancy website by simply downloading mGalla App. mGalla allows you to accept payments through UPI, Bharat QR, mPOS and link based payment methods. None of these require a merchant having a website to accept digital payments. We require our merchant's bank details so that we can get your money safely into your account. Bank details are only required for the settlement purposes. When will the amount get settled in my bank account? We follow the T+2 cycles to get the money settled in our merchant?s bank account. What if I enter wrong bank or ID details? If you enter the wrong bank or ID details, you can always change them through the app itself. Can you offer me discount if I have very large volume of transactions? You can always get started with our program, and if you have very large volume of transactions then we can always offer you customized plans. How and from where can I check the total number of transactions I?ve made? mGalla provides you with a comprehensive list of the transactions that you have made. You can always check the total sales that you have made and can compare it with the total amount that you have received. When you open the application, the information is displayed right on the top. Can I get my money settled in some other bank account? No, you cannot. We settle the money in the bank account details that are provided by you during the registration process. In case you want to change your banking details, you can do so from the application itself. How much do I need to invest for the mPOS device? What is MDR? How much is it? The rate charged to a merchant by a bank for providing debit and credit card services is MDR. According to recent Government policy, transactions of INR 2000 made through Debit cards will levy no charges. Do you support live chat? No, not yet. But we are always keen on enhancing our helpdesk and customer relations service. Where can I contact for any sales related query? Where should I contact for any issues or complains? Yes, our services are available 24*7.